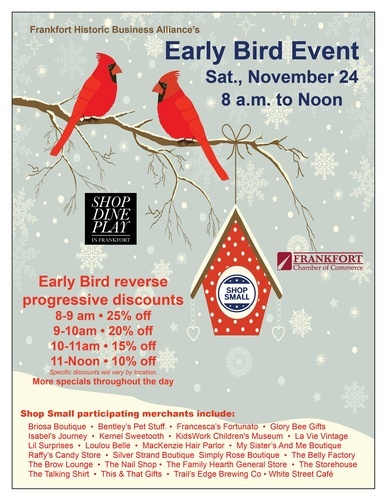 Shop in Frankfort on Saturday, November 24 in honor of Small Business Saturday®! It's a holiday shopping tradition that celebrates small businesses, and it wouldn't be a celebration without customers like you joining us. So mark your calendars for Nov 24 – the Saturday after Thanksgiving – and get ready to Shop Small® with us. Grab friends and family and hit the shops of Downtown Frankfort on the big day.